The State Council of Educational Research and Training (SCERT), Kerala has published the new text books (38 Titles) for First Year Higher Secondary (Plus One) course. 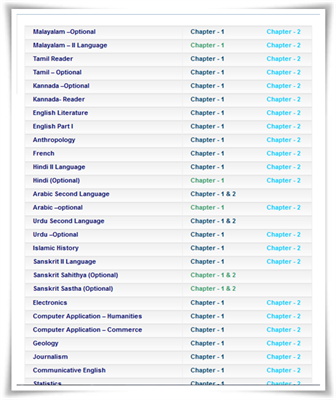 The first & Second chapters of all subjects are available for reference at the official website of SCERT. The first and second chapters of subjects like English, Computer Science and Physics can be downloaded for the website. As the books are currently printed and distributed by SCERT, it may take a little more time to get the text books in hands. Meanwhile, students can make the best use of the chapters in PDF format. The complete academic functioning is being managed by SCERT (Kerala), a R&D institute at the state level which provides guidance, support and assistance to the State Education Department. To improve the quality of elementary and secondary education and teacher education, the SCERT do conduct various research studies, develops information systems, curricular policies, and instructional materials and also co-ordinates in-service education for teachers at various levels. The academic aspects of school education which include formulation of curriculum, preparation of textbooks, teachers' handbooks and teacher training are well managed by the department. It also advises the Government on policy matters relating to school education. Various departments function under the SCERT to implement various activities and programs. SCERT plans and co-ordinates all academic projects and programs in Kerala. The Department of curriculum, text books and evaluation (DCTE) which is responsible for various tasks including preparation and revision of curriculum and textbooks, preparation of handbooks for teachers, refresher courses, orientation & training programmes for teachers function in accordance with the rules and procedures set by the education department. The textbooks of classes one, three, five, seven and Plus One have changed after five years, it may take much more time get the final print. Much interestingly, the might change in textbooks will be the introduction of a parent-friendly curriculum, giving a role for the parents to check the progress of the learning by the student.